November is here. And by all accounts, that means that the holiday season has practically gotten underway. If you haven’t yet, chances are you’ll be seeing Christmas trees, snowflakes and Santa Claus images in store fronts and shopping malls everywhere. Now, who doesn’t love Santa Claus and those big rosy cheeks? When I was younger (much younger, I promise you!) I used to think my grandfather was Santa Claus because of how rosy his cheeks were. Now luckily, grandpa was just one of those individuals with redder than normal cheeks. It gave him a jolly kind of look. His round belly didn’t hurt his jovial appearance either – especially during the holidays. I guess rosy cheeks don’t automatically indicate a good mood after all! It’s unfortunate that some of my former schoolmates had to endure teasing as a result of what I now believe was rosacea. Acne affects many adolescents but there are certainly some who get it more than others. And once into adulthood, severe cases of acne are likely even more intolerable. My online research also helped me to discover that Pulsed Dye Laser is probably the best solution to combat rosacea. 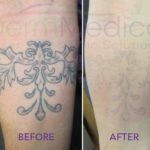 This procedure uses a concentrated light beam to target the blood vessels in the rosy skin that give that overly rosy and bumpy appearance on the skin’s surface. The laser heats the blood vessels to a point where they are removed from the problem area. This process is also very useful for disposing of other acne scars and birthmarks. The procedure lasts all of fifteen minutes and patients can resume all of their regular activities immediately thereafter. Naturally, there may be some mild bruising in the treated area, but this will all fade within a week. What’s so great about procedures like this, is that they help for patients to not only remove unwanted rosy skin conditions, but do away with the torment that is generally associated with what they consider unsightly parts of their appearances. 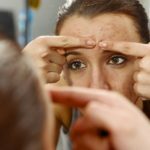 If you have any concerns at all about the appearance of acne, scarring or birthmarks, I would definitely recommend that you contact a Dermatologist. There’s certainly nothing to be embarrassed about. Although, I do hope that Santa Claus is never in need of Pulsed Dye Laser. I like his cheeks just the way they are!